The George Tavern | Pub Quizzers | Find a pub quiz near you, now. 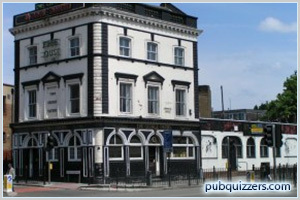 Pub quizzes take place at The George Tavern, East London on Mondays (monthly) at 19:30. Entry is £1.00, you can have up to 5 people on a team. There are prizes of cash. Happy quizzing! Modern and Contemporary Art Quiz. Quiz takes place on the last Monday of every Month. 1 to 5 people per Team. £30 to the winning Team.